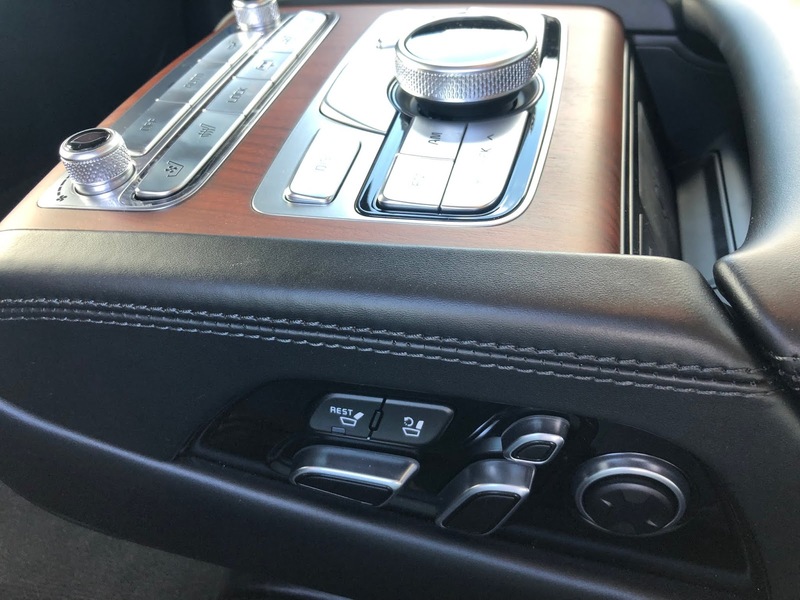 It’s got cooled, heated and reclining seats, digital temperature control, music and media controls, inductive phone charging, USB, 12 volt chargers and cup holders. Sounds like a typical decently equipped car, right? Well this is for the rear seat occupants. A little more evolved than just a leather armrest with cupholders. And the cupholders are forward of the control bank. The 2019 Kia K900 Luxury is a long wheelbase, roomy, all-wheel drive, powerful luxury sedan that offers a near effortless driving experience with a full menu of technology. With an MSRP of $64,695, it’s a lot of sedan for the price. First impression of it's appearance is a stately and elegant sedan with some European influencers. The chrome touches and multi-spoke wheels speak to it's mission without any glaring faults. In fact, it's carefully crafted all around. Where Kia struggles is perceived image. It didn’t start as a luxury brand, nor did it branch off a luxury division. The name might be too cute, just like the hamsters, and the dealership experience may not be “high end” but it’s the ride that counts. Nissan does it with the GT-R, Chevrolet does it with the Corvette, so why not with a luxury sedan? Plus, their 2011 Superbowl commercial with the How You Like Me Now song from The Heavy is awesome. This 3.3 twin-turbo 365hp V-6 model example was a gem around town and a 300 mile road trip. With the all-wheel drive traction allowing aggressive gear ratios afforded by the 8-speed automatic transmission, acceleration for a 4700lb car is definitely quick, feeling like more power than rated. It’s only at extra legal speeds does it drop off noticeably but still more than “adequate”. The subtle sound, more like a muted domestic V-8 in a Cadillac from the 1970s or 80s than a V6 hum or wail is an artificial construct from the ASD – Active Sound Design system. The Kia is a great long distance cruiser, with excellent seats and a quiet ride. Despite the high speed travel, traffic jams and heavy foot antics, it indicated it slightly exceeded its 21mpg combined rating. When the K900 is in Sport mode though, it would be a bit choppy on the freeway and held a lower gear for a little too long, hoping for that next stab of the throttle. When Sport mode is activated, the lateral bolsters give you a little extra squeeze. The seatbelt gives you an extra snug, more like a hug, when shifting to drive no matter the mode. 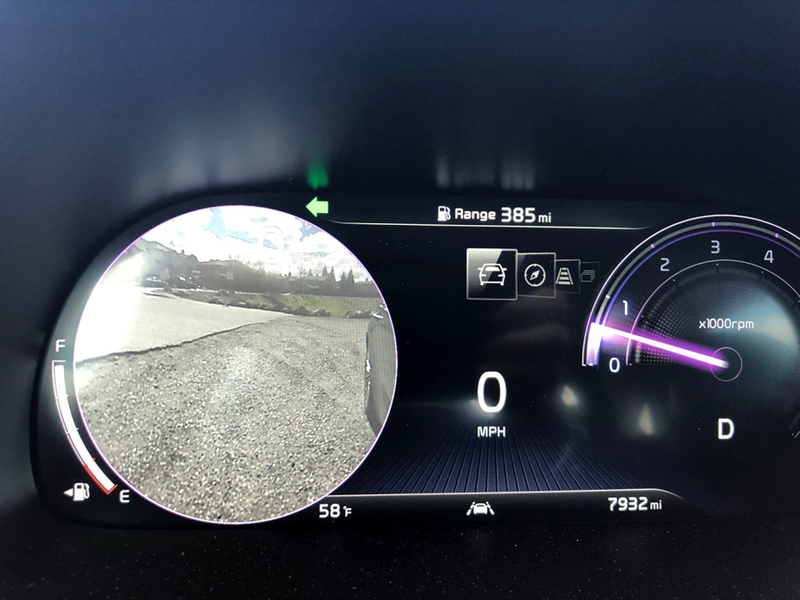 The adaptive cruise control worked well but the closest setting meant it would hit the brakes hard when a much slower vehicle was way too late to move over. Lane departure steering wheel corrections were either smooth-subtle or smooth and surprisingly strong. One intersection with a hill crest confused it a little bit. Under normal driving it was gentle reminder to stay in the center lane. The automatic engine shutoff in this $64,895 model is far less noticeable and not nearly as annoying as it is in the wife’s 2018 Audi SQ5. But still detested at brief stops when merging is about to occur like pulling out of a parking lot. Interesting about the start-stop feature, tugging on the steering wheel will not restart the engine unlike other vehicles experienced, but engaging one of the shift paddles will do so. 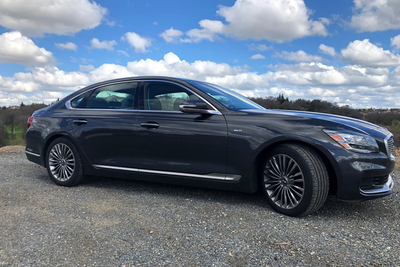 The K900 is about luxury and technology and there is plenty, especially with the VIP package in this Luxury sub-model example. The 12.3” gauge screen is an LCD TFT display with prominent speed and engine rpm displays that have an absolutely brilliant feature of turning into a blind spot camera view on either side of the car depending which turn signal is activated. It takes a little getting used to, but once you do, it’s a fantastic feature for vehicle placement in relation to other vehicles and even curbs. It was during this time that the only non-luxury aspect of the car noticed was the feel of the control stalks wasn’t quite luxury level, but to borrow an old comparison, far from the broken wine glass stem comparison I once remember reading. The speaker grills are a beautiful laser cut pieces that go nicely with the leather, finished metal and wood surfaces. The navigation screen is also 12.3 inches which enables map, music and climate settings at the same time. It’s a touch screen, a selection indicator allows rotary dial selection of functions and below the screen are push buttons a well. The configurable options are numerous from seat movement distance when ignition off to custom drive mode, and the drivers display displays the seat movement selected, which mode the windshield wipers are in, seat heating or cooling, etc. The seat cooling is spectacular, the fans cannot be heard, and I can only imagine how good they are on a triple digit day.